As I write this, my back yard is still sprawling patches of icy snow and smaller hollows of muddy dirt. Around the bird feeder sunflower shells and less desired seeds lie in uneven swells after a longer than average winter. The refuse is picked through by squirrels tired of scrambling up the narrow feeder pole only to slide down, landing with a spray of discarded seed coverings. I am eating my lunch and watching the pageant of feathered friends arrive and depart. Some perch and eat, others grab and go. There is obviously an understood Who’s Who that keeps the buffet line moving smoothly throughout the day. The cardinals come at dawn and dusk, the small social birds shortly next, the starlings with the red-winged blackbirds among them, whenever they want. The flicker dominates the suet for minutes at a time. Then suddenly all I see is a flash of his white rump as he undulates through the branches. Then the “Big Boys” as I like to call the crows, announce their arrival well before landing to strut, socialize and lift up as one and settle back down in an choreographed landing to pick through the ground cover. Such communicative beings who manage in close proximity not to slap each other silly with those big wings! We humans throw around words like “inter-connectedness” and say things like, “We cannot think ourselves separate from other beings”, but do we really believe that? Thich Nhat Hahn created the term “interbeing” and said, “The whole planet is one giant, living, breathing cell, with all its working parts linked in symbiosis.” Do we really believe mosquitoes are necessary or just irritating or that birds are pretty we humans need them? Am I part of the flock? 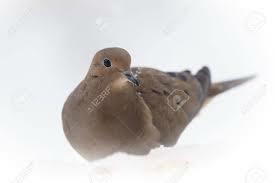 As I chew on that question and my lunch I start wonderng “How am I like the Mourning dove?” Like the who has hunkered down in the snow for the last 5 minutes as though she is perfectly comfortable. I can only think cold, wet bottom. 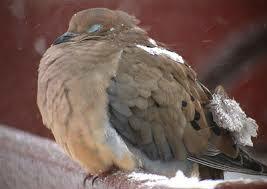 OK, so both I and the dove are breathing, have blood in our veins, a mouth and stomach. We both have a sense of smell, sight, hearing, touch and taste –well, maybe taste for the bird, not sure about that one. We both fly – slight difference in the way we go about it though my mode of transportation is based on Dove Aerodynamics. We both have to eat to survive. I stop chewing. Oh, I don’t eat just to survive. I eat for lots of other reasons – something to do, distraction from something I should be doing, thoughts and emotions I don’t want to have, reward, the it’s-time-to-eat habit . . . I look out the window. It’s pure survival for that dove. Moment to moment survival – food and shelter. 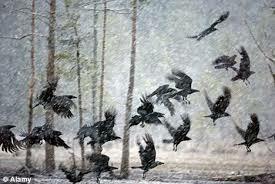 Dependent on moment to moment awareness and alarms sounded by other feathered beings. Who’s the intelligent one here? But my life is not about that kind of survival. In fact, I don’t even think in terms of basic needs for survival. I eat when and what I want. And this is where it gets sticky for me, the “when and what I want” part. I know there are a lot of differences between me and that gentle dove who only eats to sustain her life and feed her babies. I don’t have wings or a beak and she doesn’t have arms. She has an intelligence that I will never have, and she doesn’t need the brain I’ve got in order to survive. She knows what’s important in her life. Do I? When and what I eat does connect me with that 4.5 ounce (128 gram) feathered marvel whose eyes, I believe, have just closed as though she’s decided with a full tummy, this is as good as any place to nap before moving on. I have lessons to learn from my fellow feathered friends about eating only what is needed to sustain my life. And not eating to feed my heart or my greedy nature or purely for pleasure or just because I can. Am I respectfully sharing this life-sustaining earth with other beings or am I using more than my share? We like to think, with some amount of pride and defense, that we humans are so much more complicated than other beings. But maybe our craving for more and more and more complicates rather than satisfies. Maybe contentment and happiness are dove simple. Can you think of places in your life where less has been more? What would it be like not to misuse food, but only eat enough to sustain your life? This one really hit home today!! Thank you for the provocative questions in a kind way. I will need to “chew” on this.